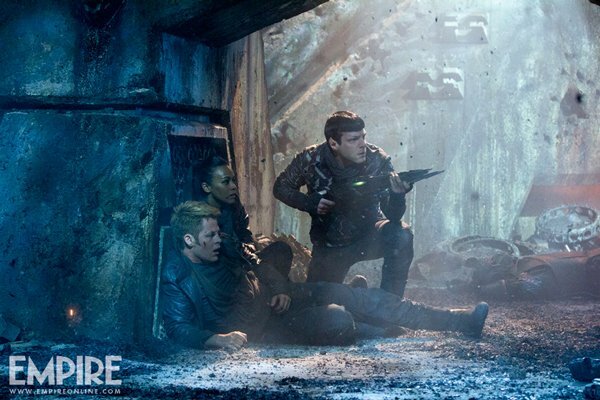 After the action-packed international trailer that debuted last week, it only makes sense that the two new images from Star Trek Into Darkness feature our heroes in the thick of fighting back. 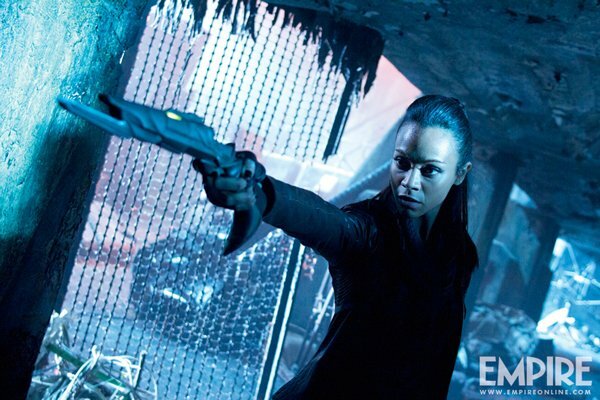 Above you can see Spock (Zachary Quinto) stepping up to the defenses while Kirk (Chris Pine) and possibly Uhura (Zoe Saldana) seem to be down and recovering, and in another below you can see Uhura step up herself, holding a very mysterious looking weapon while she's at it. Both images premiered at Empire. You might notice those weapons look a little fancier, and a little more alien, than what we usually see in the hands of the Starship Enterprise. I have it on very good authority from renowned Trek nerd Jordan Hoffman that both Spock and Uhura are holding Klingon disruptors, Spock's a rifle version and Uhura's a standard handheld one. We've been hearing rumors of a Klingon presence in Star Trek Into Darkness since J.J. Abrams snuck an image of one of them into the background of a fluffy MTV Movie Awards bit, and just a few weeks ago Abrams again promised that Klingons would be included, after being mercilessly left on the cutting room floor for 2009's Star Trek. But how do Spock and Uhura wind up with Klingon weapons, and who are they shooting at? That remains a mystery, one of the many still intact as Star Trek Into Darkness gets ever closer to its May 17 release date. You can click here for everything else we know about it, though to find out if Benedict Cumberbatch really is Khan, you'll probably have to wait to see it for yourself in theaters.